Leveaux Mtn Lodge, a beautiful vacation rental home near Tofte, MN that makes you feel like you are on top of the world! LeVeaux Mountain Lodge is truly a secluded, hidden gem located just outside of Tofte, MN. A gorgeous retreat with 2 bedrooms, 2 bathrooms, and a central location to many North Shore attractions. This unique property features a seasonal pond right on the property which attracts all sorts of wildlife for your enjoyment. While not directly on Lake Superior the views of the lake are fantastic and the seclusion of this spot makes it great for a romantic getaway. The open layout living space features a living room, dining room, and kitchen on the upper level. Sink into the comfy couch with a good book after a long day of exploring the North Shore. Or better yet- put your feet up on the lounger and really let yourself relax Get the fireplace going on a cold winter night and let the heat warm you up. Even if it`s the middle of summer and too warm for a fire, the beauty of the stone-surround and the views of the lake right next to it will make you feel at home in this mountain retreat. The living room area flows easily into the dining room and kitchen. Never miss a moment of spending time with your family. Seating for everyone around the dining room table, great for enjoying meals during your stay. We hear the table is a great place to gather the family and play a board game together, as well Moving next into the renovated, modern kitchen. There is seating for four at the kitchen bar, perfect for serving breakfast on a Sunday morning. The beautiful custom cabinetry and large island make this kitchen a joy to cook in. Enjoy the use of the dishwasher during your stay- no need to take the time to do dishes when vacationing. While you cook you can continue to interact with your family and friends in the living room as well as enjoy the great Lake Superior views. The futon is not only an additional seating area but is also an additional sleeping area, making this home great for up to 6 guests. The master bedroom, located off of the living room, has a queen bed, office space, and private bathroom. Curl up at night in this beautiful four-poster bed in the master bedroom. The office area, located between the bedroom and the bathroom in the master suite, is perfect for doing work during your stay - if you must. Sore after a day of hiking Fill the jetted soaker tub and relax those muscles. The lower level bedroom features a queen bed and lots of privacy. The lower level bathroom has a walk-in shower. The lower level bathroom also has a washer and dryer which is great for extended stays. Grab a cup of coffee in the morning and head out onto the deck to watch the sun rise over Lake Superior. Or sit back and enjoy watching the wildlife that abounds at this gorgeous home. LeVeaux Mountain Lodge can become your new home away from home on the North Shore. With amazing views, a seasonal pond, and plenty of room to roam, you may never want to leave. Ducks and deer really love the pond, which is usually vibrant and alive in the spring, summer, and fall. Be sure to take time to stop and smell the flowers. Even in winter, LeVeaux Mountain Lodge is a wonderland - perfect for sledding and amazing Lake Superior Views. What a true hidden gem! 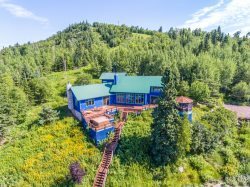 This newer, extremely private, year round home is located in Tofte on the LeVeaux Mountain hillside. You'll enjoy easy access to hiking and cross-country ski trails on both LeVeaux and Oberg Mountains, making LeVeaux Mountain Lodge the perfect home base for a North Shore adventure. The tastefully appointed home features 2 bedrooms and 2 bathrooms, lovely southern yellow pine floors, bedroom and bath on each floor for privacy, and views of Lake Superior. The hiking trail is located right off the north end of the parking area. It's minutes from the Lutsen Mountains and the Superior National at Lutsen Golf Course. This property is perfect for the discriminating vacationer. In the warmer seasons, you will find a quaint, peaceful pond right on the property. The pond attracts wildlife like ducks and deer who come to cool off or get a drink of water. During the winter months, LeVeaux Mountain Lodge becomes a winter wonderland, perfect for sledding and close to snowmobile access trails. LeVeaux Mountain Lodge is centrally located near many of the North Shore's most popular attractions. Here you are just a short drive away from the beautiful Oberg Mountain Scenic Overlook and hiking trail, a must-see during leaf changing season. Head down the shore and check out Temperance River State Park or head up the shore and you will find Cascade River State Park- both great for hiking and enjoying some beautiful waterfalls. The Gitchi Gami Bike Trail goes right in front of the resort and runs along Highway 61. The trail is enjoyed by bikers and walkers alike, taking a scenic ride or stroll along Lake Superior's shoreline. The Lutsen Mountains recreation area is just 10-miles away and offers both winter and summer activities, including downhill skiing, the alpine slide, and a scenic gondola up to the Moose Mountain Summit. Enjoy the many restaurants and live music offered year-round on the mountain, as well. Whether your visiting in the summer, fall, winter, or spring, the list of things to do is seemingly endless! Summer on the North Shore brings mild temperatures and tons of outdoor activities, including hiking and mountain biking. Color change season in the fall is unlike anywhere else- with colors so vibrant the hills look like they are on fire. In the winter, the area is a premier downhill skiing destination and you can easily find snowmobile trails, cross country ski trails, and even groomed fat bike trails. Don't forget spring and "waterfall season". As the snow melts inland and makes its way toward Lake Superior, our waterfalls truly come to life and are a sight to be seen. Waterfalls also form along the edge of Highway 61 so you can enjoy them during a leisurely drive up and down the shore. Be sure to experience every season at LeVeaux Mountain Lodge. Allergy Warning: Guest with pet allergies should be aware that while this home is NOT a pet-friendly rental the owner has a pet and there may be some hair/dander present. A dander-free home cannot be guaranteed. For Winter Stays: LeVeaux Mountain Lodge has a steep driveway and roadway that can be difficult to navigate with snow and ice. We recommend either 4WD or very good tread on your 2WD car. Please contact us if you are concerned. Nice view, feels secluded, and great landscaping/yard area. Comfortable and clean, great location with amazing view of Lake Superior. House was equipped with everything we needed and was in a good, central location to access all that the North Shore has to offer. The house was great, location was even better. We came to get away from the hustle and bustle of work and family life and this exceeded our expectations! Beautiful, comfortable home. Quiet location, lovely views. Would love to stay here again! Location was perfect. Home was extremely clean and comfortable. Loved the decks. Deck furniture was very comfortable. View was awesome to watch sunrises. Upstairs bed and bedroom was very comfortable. Downstairs bed was not comfortable but it worked, however the bedroom was very nice. This matress probably needs replaced. Linens were of nice quality. We enjoyed the open layout. Everything we needed was avaialable. Overall a very nice place and I would stay here again. I liked that the kitchen was pretty well stocked with cooking utensils and other needs, the views were amazing and the big bath tub was awesome. The grill and fire pit were great as well. The home was very cozy and clean! We loved the views and relaxing on the deck with coffee. The only issue was the temperature. Wouldn't be an issue in cooler months but it was in the 80's inside the home during our stay. The home has a very private location yet quick access to the highway. View from the decks are beautiful. Quality and comfort of the home are excellent. It would be nice to have a bunk bed in the lower level bedroom to accommodate kid's better. They make really nice double/twin bunks that would be perfect. Wifi connection was great according to my teenagers. Over all our stay was wonderful. Beautiful location, with wonderful landscaped yard and terrific views from two decks. We were very comfortable here. Loved the privacy, the sense of solitude. We had a great experience. If I had one request it would be for some kitchen storage space for our non-refrigerated foods. We had to just pile things on the breakfast bar. The home was exactly as portrayed on the website. Great location and great view. The beds were comfortable. Could have done with fewer knick knacks, but it was decorated nicely. Appreciated the books on the North Shore - used the one on waterfalls to plan our day trips. The home was lovely, it was well stocked, beautiful view and wonderful fireplace. We were however disappointed in the access to the snowmobile trails. When making the reservation, I was told the snowmobile trail is right behind the house and there was easy access to the trail by the garage. There was no cleared trail or clear path, and we had to make our own path which was about .5 miles back to the trail. very nice home, well kept up. nice view of the lake. like the location between Duluth and GM. We loved the home and the area, we will be back. It was so peaceful and serene! If anything we would like the option to turn off the water fountain at times, we missed the quiet and the sound of the birds. But if we got up early it was perfect, the fountain was on a timer that started at 8. The mountain lodge was amazing and beautiful. The owners thought of everything detail and the layout of the home was perfect. The view of the lake was awesome. The drive to the highway was quick and easy. If we.come north again being able to stay at this home would be important to us. Thank you again for all your help in coordinating our wedding stay at Leveaux Mountain Lodge. We've already passed your name on to a number of our guests and are looking forward to our next vacation up north! The home was fantastic. It was extremely comfortable and well appointed. The home has a wonderful view of Lake Superior and is in a very quiet, private area. It was everything we were hoping for! Cascade Vacation Rentals was very easy to work with and I would definitely work with them again in the future. The home was lovely- definitely as the pictures depicted it and better! The amenities were top notch quality and it was a very comfortable home. The view is lovely from both of the porches.